How much time have you spent trying to recreate or build schedules? What about trying to find or share a schedule? With UNIFI’s newly released support of Revit Quantity Schedules, you can easily set up or retrieve a schedule in seconds and you don’t even need to open Revit to view it. Learn how this time saving, headache-free solution that will enable you to focus on what you do best – designing and building structures. And, attend our webinar on October 26 at 10amPT to see Schedules in action. Schedules are data-centric views of a BIM model and are critical to a firm’s documentation workflow. The manner in which firms create and deploy schedules is similar to how content is managed, since schedules are the tool for the reporting of quantities and attributes of content. Hassle-free set up – While other folks still debate how to best organize, maintain and distribute schedules inside of Revit project files (optimal balance of quantity, organization, etc. ), UNIFI allows you to free your schedules from these painful workflows! Set up is extremely easy and matches the familiar upload process, versioning and revision process used for other elements, saving considerable time. Easy access – Individual schedules are immediately indexed and accessible through our powerful search system without any extra effort to manually meta-tag or parse data out. Our analytics show us that 80% of inserts made by customers were displayed in the top 10 search results. Fast – Don’t bother anymore with the time consuming task of opening a container Revit project file every time you have to access a schedule! 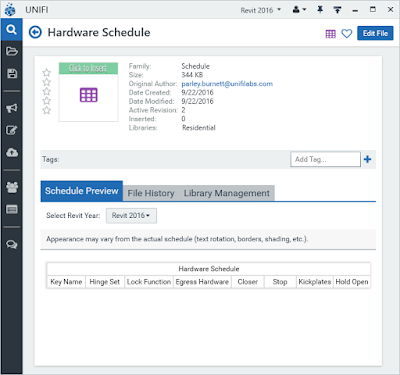 With UNIFI, schedules are stored as small, individual, versionable elements – fast to preview and fast to add to your project. Instant Previews – In UNIFI, you can immediately preview the schedule. Our platform does the heavy lifting for you by analyzing the schedule structure, then rendering the schedule header for you. You can even cycle through previews for each base file. Customers will now enjoy storing all of their schedules in the cloud, ensuring they have access to them anywhere, anytime, on any machine. One customer we recently spoke with has over 400 schedules already planned to utilize this new feature and give their users access. Schedules support is a great addition to UNIFI’s already supported Revit element types of Families, System Families, Drafting Views and Groups. Schedules can be added to UNIFI by opening a project and then opening the ‘Batch Export’ dialog. Schedules will appear there as a parent type and expanding this will reveal all of the available schedules. Choose the schedules you want to store in UNIFI and click “Export”. This will queue them up in UNIFI for upload – just like any other element, you can choose your tags and libraries before uploading and following upload they follow the same approval process that you’re familiar with already. In Browse mode, schedules will appear as their own folder after choosing a library. Schedules will also appear in your search results if your search term matches against tags, the category of the schedule and of course, the name. You may also apply a filter for ‘Schedules’. Inserting schedules works like other elements; simply click ‘Insert’ to load into your project. To assist you in making a selection, a view of the column headers is even conveniently located on the Details page. Schedules are managed like every other element type. Tagging, renaming, library management, custom preview images, revisions, etc. are all handled the same way. 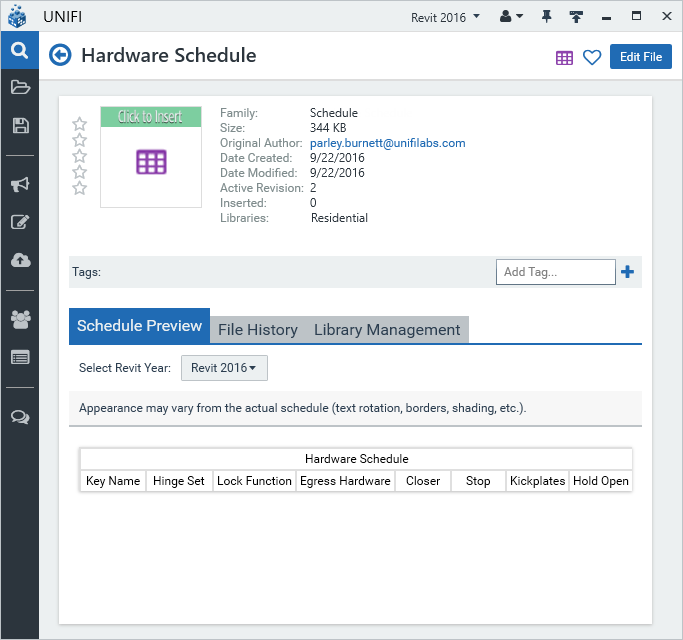 UNIFI’s new Schedules capabilities provide even greater value to leading architectural, engineering, construction firms who use UNIFI to create and manage their building content. Stay tuned for additional value added features in upcoming announcements. And, be sure to attend the webinar on October 26th to see Schedules in action.